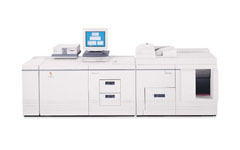 The Xerox DocuTech 6135 is an all-in-one, everything-you-could-ever-ask-for printing system. More than a high-speed, high-volume laser printer, this sophisticated publishing tool offers a wealth of functions and features, 600 dpi resolution and a throughput of up to 135 pages per minute. In short, this machines offers fast, efficient publishing by avoiding time-consuming pre-press steps. The 6135 can print them directly from a digital file, offering complete flexibility in regards to variable data materials. Add to this all of the finishing features needed to complete a clean, professional looking product--like automatic duplexing, stapling, and tape binding--and you end up with an indispensable tool that can accurately reproduce even the most complex documents.